As analysis of when to publish posts go, today is possibly the worst day to put up one and possibly I am shortly encroaching on the most insane hh:mm of the year! But, I cannot let the day go by without giving my thanks. Also, I am wrought with guilt in having been making merry and not quite showering this space with the love I had originally planned. As you know, I had been in Israel last week. Now, I am in Turkey amidst the stunning beauty of inland Cappadoccia where the natural geography is as awe inspiring as the history of the original cave dwellers. There is much here that makes me marvel at the tenacity and ingenuity of the early civilizations. In the two days that I have been in this country, I have smitten by its beauty, the hospitality of its people and the general welcoming feel around here. I will write more about my experiences in a later post when I have properly collected and collated my thoughts. In the mean time, I simply want to take this day as an opportunity to thank you, my wonderful readers, friends and well-wishers for the support, feedback and shower of love that you have given this site and me over the years. While this is a time to cherish our loved ones ever more, I feel it also time for me to be grateful for the generosities and kindness of unknown faces. For the unexpected niceties that life throws at me. For the strength within to face up and out ride challenges. For the wonderful beauty around that takes my breath away as soon as I pause for but a moment. For the freedom I have that so many more aspire to. For love, joys and sorrow! This is a very simple one pot dessert that comes together very easily and takes about half hour from mixing bowl to plate. I serve it here with a side of boozy fruits but you can go with ice cream just as well. So, here is toasting to the life that pulses within us! Happy Turkey day!! Puree all the ingredients to a fine, smooth mixture. Pour into molds of desired size and shape. Line the molds in a baking pan with about 1/4 inch of hot water, creating a water bath. Bake for about 25 minutes until just set. Hope everyone had a fantastic Thanksgiving with not very pervasive hangovers! :) I'll tell you how our Thanksgiving went when I am back in town! :D. Can't wait to see how it goes!! In the meantime, I wanted to share with you an ethnic comfort food that will be perfect for that leftover turkey/meat - Parsi Dhansak. 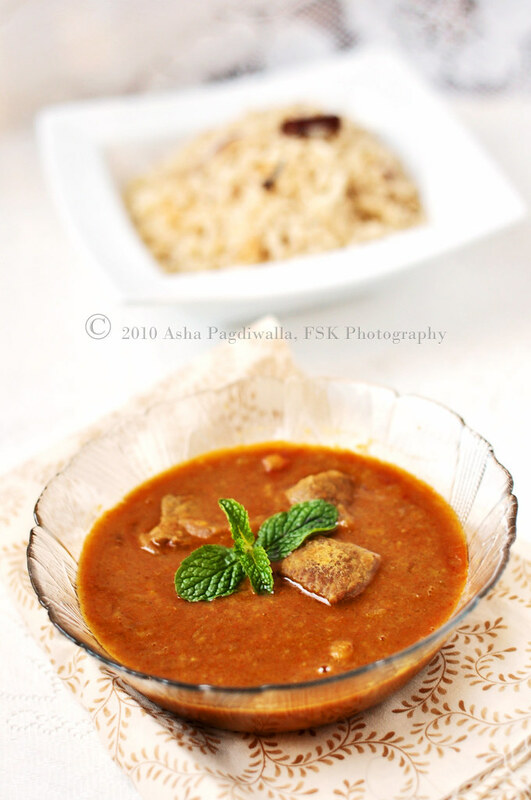 Dhansak is the quintessential Parsi dish. 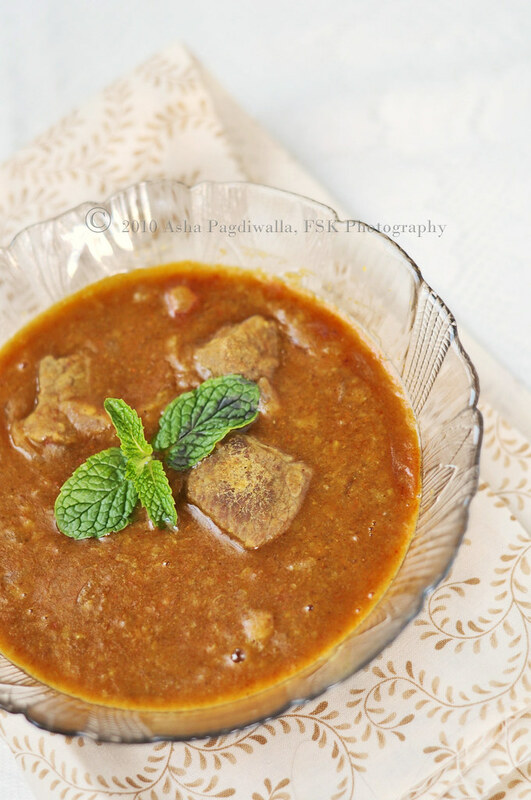 It is a stew of lentils and meat flavored with traditional spices and brown sugar or jaggery. The dish is mild and tangy with just a touch of sweet to represent the balance of yin and yang in life. Now, I am sure you want to know, who/what are Parsis. :) Well.. Parsis are Zoroastrians, originally from Persia who later, fearing religious persecution, took refuge on shores of Western India. Reflecting this confluence of cultures, old and adopted, their cuisine is a meld of Persian origins and Indian influences. For Velveteers this month, we chose the challenge of finding a Dhansak recipe, by hook or crook. I share my family's recipe here. There are two major foot notes to this dish. One, the lentils have to be pureed. Parsis will not touch a lentil stew that is chunky. 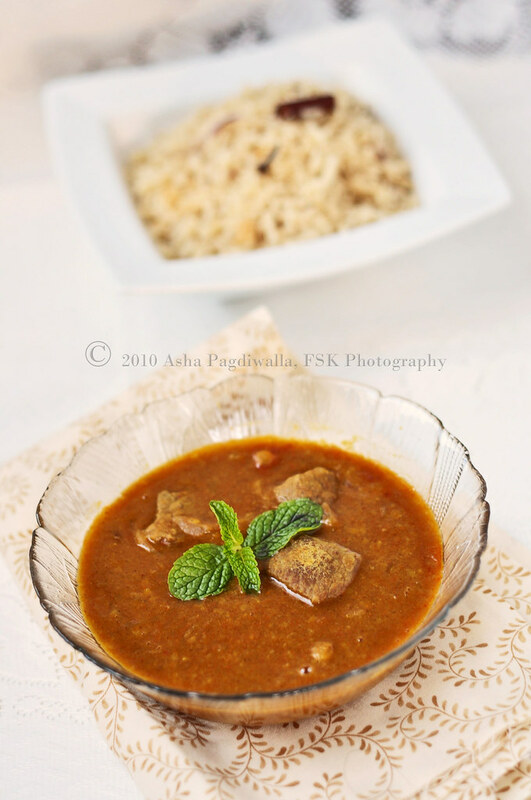 Two, Dhansak is always accompanied by a particular brown rice, the flavor and color of which come from caramelised sugar. Also, Dhansak is never served on a good occasion. You can use any meat in the stew but mutton is most popular for it's flavor. The pumpkin serves dual purpose. The protease in it will break down the meat proteins making them tender and it adds body to the stew. If you don't have pumpkin, substitute with potato. The distinctive flavor of the stew comes from the Dhansak masala which is somewhat similar to garam masala but different! :) You can purchase it from any Indian store or make your own. I use a pressure cooker to cook my lentils and pre-cook the meat. If you don't have one, then cook them in enough water over low heat until the lentils are tender enough to be pureed with a whisk. If you are using chicken or pre-cooked meat, add it directly to the cooked lentils while cooking the lentils. In a pressure cooker, add half the onion, ginger, garlic, tomato, pumpkin and lentils. Add three cups of water. Place the red meat (previously uncooked) gently spread around the bowl. Cook the contents for 5 to 6 whistles. When the steam has cooled off, remove the lid and let any remaining steam escape. Using a slotted spoon, remove the meat piece and set aside. Whisk the lentils mixture to a smooth puree. I find a handheld whisk works just as well here. Set the lentils aside. In a heavy bottomed pan, saute the remaining onions until soft in three tablespoons of oil. Add the ground spices and saute for a couple of minutes over low heat. Add the remaining water and bring to a rolling boil. Gently add the lentil mixture and bring it back to another boil. Add in the meat pieces, bring to another boil and then simmer until the meat is tender. Over low heat, saute the whole spices in the ghee until the aromas release. Add the onions and saute until soft. Add the sugar and let it caramelise and brown. Quickly add 4 cups of water and bring to a boil. Add the rice and salt and cook until rice is fully cooked. Velveteers was started by Aparna, Asha, Alessio and Pam, who are passionate about different cuisines and food in general. Each month, we will attempt a new dish and share our experiences and the recipes we used. If you’re interested in joining the Velveteers, please feel free to drop by our food blogs and leave a comment or drop me a line at asha@forkspoonnknife.com. You can also visit our google group, The 4 Velveteers. Please visit our group to check out what everyone has created this month!